During periods in history when governments move away from gold backed currencies gold will revalue itself in the open market. 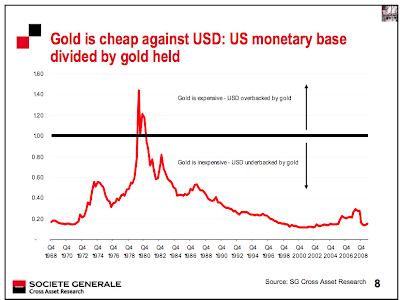 Market forces will "re-price" gold to back the supply of currency available. I like to think of this as an accounting or balance of payments. The chart below shows that mark being reached in 1980, and it shows where the gold price is today in relation to the new currency that has been created since that point. Prepare and anticipate massive pull backs along the way, but understand where we are in the big picture.